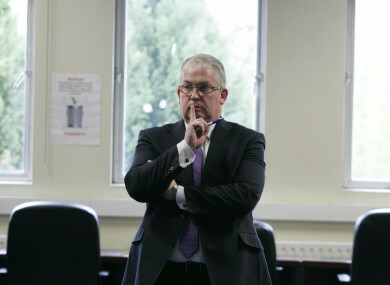 Tony O'Brien listens to Dr Susan O'Reilly, outline the HSE's response to a report into the deaths of babies in the Midland Regional Hospital (May, 2015). FORMER HSE DIRECTOR general Tony O’Brien has attacked the Public Accounts Committee (PAC), accusing its members of “corroding public life with their antics”. “What it does, is it chases every passing controversy, and pay no respect to individuals, and it doesn’t add any value,” he told RTÉ’s Marian Finucane Show. He said that the PAC handled controversies that were better suited to the Health Committee, and that it had strayed from its original purpose. He said that the actions of those in the Public Accounts Committee deter people in the private sector from working in the public service in Ireland. If you said black they would say white, if you said red they would say green. “I didn’t say anything in public that he didn’t know in private,” adding that “politicians shouldn’t rise to the media bait” when they’re asked if they have confidence in an official or minister. He said that he was brought in to wind down the HSE, but half way through his tenure “it became clear that that wasn’t going to happen”. When we talk about the abolition of the HSE, it’s not about abolishing the health service. I was never in favour of the HSE [or how it operates]. It’s whether it’s adding value or costing value and I think it’s costing value. He said that it was best to wait for the PwC report that is being carried out into how the costs increased before action was taken in relation to those being held accountable. The report will cost around €400,000. Tony O’Brien resigned from his role as HSE Director General in wake of revelations relating to the CervicalCheck programme. He appeared before a number of committees to answer questions about how many women were affected and what they were told. He was due to retire ten weeks later, but said that he would have liked to have remained in the job. “I am glad to be out,” he told Marian Finucane today. Email “Tony O'Brien accuses the PAC of 'chasing every passing controversy... it doesn't add any value'”. Feedback on “Tony O'Brien accuses the PAC of 'chasing every passing controversy... it doesn't add any value'”.